Do the below figures mean the same thing? Or rather, if I wanted to translate quote in to image and image in to quote, could I express the same thing in both, or could they be read the same way? 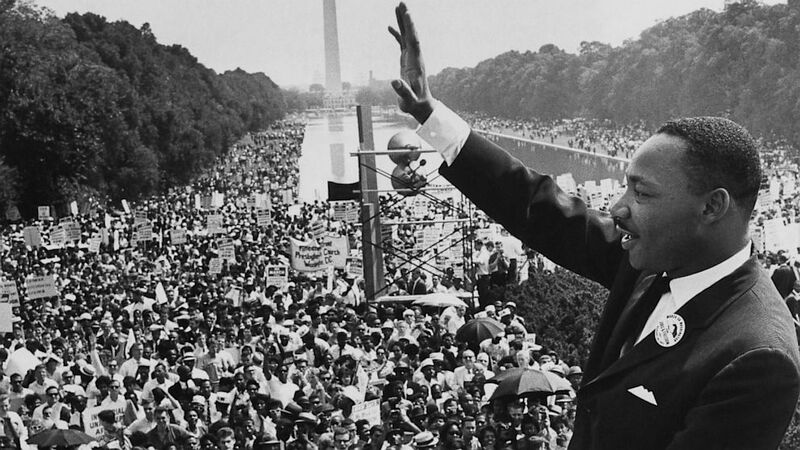 When we google “I Have a Dream” and click on the Images tab, figure 1 is one of the first visual signifiers to appear. Does this photo put in to visual form the text from figure 2, the iconic quote from Dr. King’s speech on that day in Washington? Since this overview of media praxis, or the practice-theory paradigm in media studies, will in many regards address emancipation – maybe not from an oppressive State authority but at least from the mediated tools of ideological coercion that oftentimes shape State policy – this opening example isn’t too far off the mark. I began to approach the idea of the link between media practice and theory, the idea of theoretical practice, by finding an example. An example of praxis, or an enactment of theoretical conjectures, a term I borrow from USC’s Media Arts and Practice which in turn sources it in Gramsci via Marx, can be hard to come by, especially when we limit ourselves to those works that clearly say something but their design decisions are hidden under mounds of textual information. This may go to say that any cultural or material output could be considered a tangible expression of conceptual meaning, that looking for an example of praxis when praxis exemplifies itself is much like looking for an example of a cat at the Humane Society. However, my field being film studies, many such examples came to mind, the first of which being Dziga Vertov’s Man with a Movie Camera (1929). The film is equal parts adored by film professors and reviled by undergraduates as much as it might be equal parts theory and practice. Dedicated to what he termed “film truth,” Vertov created a film that enacts his post-human vision perhaps with a more impactful result than if he were to only write it down, which of course he did. He writes in WE: Variant of a Manifesto: “In revealing the machine’s soul, in causing the worker to love his workbench, the peasant his tractor, the engineer his engine—we introduce creative joy into mechanical labor, we bring people into closer kinship with machines, we foster new people” (8). That last part is worth repeating: “We foster new people.” If Vertov’s work is our example of praxis it would seem praxis also goes hand-in-hand with the educational project of “fostering new people.” His praxis was a way to be and learn, an exercise whose theoretical and educational goals were exemplified by its own practice. This leads us to our first tenet: the act of pedagogy, of the type of educational practice undertaken by Vertov, itself is a praxis. We’ll return to this liberating notion later in the overview. So maybe Man with a Movie Camera might be too easy an example – Vertov is historically considered both an accomplished film practitioner and a theorist, someone who zealously and very publicly revealed the theoretical purpose behind his work. A more difficult example might be an even more common one, a film that doesn’t conveniently come with a matching manifesto. Chris Nolan’s most recent blockbuster Interstellar (2014) reaches its climax when Matthew McConaughey’s character sends a message to his daughter across time and space. To do this he manipulates time when it’s rendered into a physical object at the center of a black hole – he etches a message in physical time, one that his daughter must interpret. The blocks of time are reminiscent of books on a bookshelf or long streaks of film carrying their hidden messages from the past. His daughter figures out the message and saves the world, implying that a proper command of historical knowledge and the media forms it takes could make the difference between life and death. This pitch for media literacy isn’t as literal as Vertov’s, and in fact it’s my pitch, not Nolan’s. So is the lesson that media practice, the act of putting the thoughts in our head in to the form of a (mass) message, is always theory but theory isn’t always practice? If Vertov is our example of media praxis, what is Interstellar? Just some movie? Does Nolan’s outspoken pro-film stock attitude speak to the theoretical design of a movie about material messages passing through time? Or is that my “read” alone? By raising these questions I have quickly engaged in the rhetorical measure of media praxis. These questions are philosophically tricky and stand as a challenge to media pedagogy. Many media-related programs in higher education as well as social activists working outside or in relation to academia now recognize the pedagogical imperative of media praxis. Pedagogy itself is, almost literally, practiced theory, yet it’s taken media studies up until only recently to realize that its pedagogy must also include an enactment of its critical attitudes. This might be read as a cultural and intellectual pushback to what Henry Giroux calls the “depoliticization of education through historical amnesia” (30). Although there are programs that are beginning to embrace politically charged praxis and literacy courses in their core curricula, Giroux is right when he recognizes the technical, not political, approach the university undergoes in relation to media praxis. In similar ways to how Julia Flanders describes her experience as a consultant of digital humanities, a burgeoning, shapeshifting field that often butts up against concerns of media praxis as media literacy, digital humanities seems to perform a consulting role within the university. Flanders, writing in the recent publication Debates in the Digital Humanities, rightfully celebrates the kind of digital literacy work she was able to accomplish as a consultant, but her own professional trajectory is one of marginalization – it’s even in the title, digital humanities, as if digital and media literacy must be set aside from traditional educational groupings and only enter the picture to provide some zeitgeist credibility to those in need. Programs like Media Arts and Practice from my own University of Southern California, which has grown immensely over recent years and continues to grow, Media, Culture, and Communications at NYU, and the Instructional Technology and Digital Media Literacy program at the University of New Haven have all designed courses in media praxis that emphasize a critical enactment of media theory. These programs are housed in a variety of schools – Cinematic Arts, Liberal Studies, Education, and they certainly hold very differing ideas in regard to the digital humanities. In fact where they are at any given university has become a bit irrelevant as they do act as university consultants, oftentimes shopped out to a variety of hard and soft science departments that seek to harness digital literacy in aid of what Giroux calls their “conceptual-empiricist” or “technocratic” worldview. With the need for digital relevancy becoming more and more palpable, media literacy tools and databases that might supplement or altogether replace critical digital pedagogy are increasingly common. Early online research tools that everyone has most likely used at one point or another, including the Internet Movie Database, or IMDB, has given rise to media literate databases like MIT’s _docubase, “an interactive curated database of the people, projects, and technologies transforming documentary in the digital age” (taken from their website). The _docubase is not only useful as an archive for documentary studies but also as its own experiment in digital media literacy – it teaches its own miniature version of media navigation while also behaving as a hub of digital literacy tools, like editing and interactive software that makes critical media practice possible. Like Vertov’s Man with a Movie Camera, the _docubase self-reflexively practices what it preaches, a multimodal understanding of documentary in the digital era. Jennifer Proctor, writing as part of the Society for Cinema and Media Studies Cinema Journal Teaching Dossier, addresses how an online media-making or editing tool can be used to teach media, cinema in this case, and fulfill that “practice” element of media praxis. Unable, of course, to produce the polished results someone like Chris Nolan is used to, Mozilla’s Popcorn Maker remains a good example of how digital media pedagogy gives way to a process of self-learning. Proctor highlights the type of self-reflexive interpretation students go through when asked to work inside the media in order to inject their conceptual interpretation into the media message itself. In this way students create their own, remixed media message that can be paired with a theoretical impetus, and then a new interpretation, and the wheel of critical thought turns. But this is a two-step process masquerading as three steps (see figures 4 and 5 below). In this model Vertov’s written manifesto is separated from his visual manifesto, the film, and the reader’s interpretation sits apart from what could be considered a media object or media message. Now, Vertov’s literarily expressed theory and his visually expressed theory are absolutely different and can be considered as such, but what Proctor and media praxis teach us is that every interpretation translated into language – be it oral, written, visual, etc. – becomes its own object of practice, an act of communication aimed at a new or repeating interpretant. For Proctor and Mozilla’s Popcorn Maker, the end goal is always this role reversal or exchange, where a self-reflexive critique of the media tool itself – perhaps how it encourages a participation with the media that upholds techno-hegemony – is a natural byproduct. Calling the false distinction between media artifact and interpretation, practice and theory, what it is, false, isn’t just me getting finicky with my terminology, it’s one of the foundational elements of a critical pedagogy and a model for critical learning. Eliminating the distinction, then, takes a political turn, as it seeks to collapse the boundaries between ethical thought and ethical action. It reminds us that ethics are thoughts in action, and that life makes no distinctions between our political selves and our apolitical selves. Media praxitioner Trinh T. Minh-ha invokes the doctrine of Mao to describe it: “…the theoretical project is not ‘just a theoretical project,’ but one that, despite its reality as theory, grows out of a social, cultural, and political context. …our life activities are inseparable” (40). If the digital humanities is to move beyond its nebulous role as digital “consultant” it must first embrace this credo. Digital critical pedagogy has no gradation – it doesn’t meet half-way between its own methodology and the needs of a market-driven academy. In the same way, media objects can’t meet theory half-way nor vice versa. Man with a Movie Camera is Vertov’s point; the manifesto clarifies that point. Like all movies, Interstellar teaches us how to watch movies, but inseparable to that is how we as a society, a culture, a politic, have taught it how to be a movie. Our life activities register as talk-back, as new interpretations of what are always only interpretations themselves. In Giroux’s words, if we are to use these interpretations, our life activities brimming with political energy, “as a mode of intervention” (14), then an introduction to the tools of critical media literacy can also double as an introduction to our own agency. In this way we might best become our own, living examples. Flanders, Julia. “Time, Labor, and ‘Alternate Careers’ in Digital Humanities Knowledge Work.” In Debates in the Digital Humanities. Edited by Matthew K. Gold. 292-308. Minneapolis: University of Minnesota Press, 2012. Giroux, Henry. On Critical Pedagogy. New York: Continuum International Publishing, 2011. Ranciere, Jacques. The Emancipated Spectator. Translated by Gregory Elliott. London: Verso, 2009. The Future of the Image. Translated by Gregory Elliott. London: Verso, 2009. “What Medium Can Mean.” Translated by Steven Corcoran. Parrhesia 11 (2011): 35-43. Trinh, Minh-ha T. Cinema Interval. New York: Routledge, 1999. Vertov, Dziga. Kino-Eye: The Writings of Dziga Vertov. Translated by Kevin O’Brien. Berkeley: University of California Press, 1984.